First, it was Chan Sheng Yao of Hwa Chong Institution. Yesterday, Lynette Lim of Cedar Girls Secondary School became the second student-athlete to set a national open record at the ongoing National Schools Track and Field Championships. SINGAPORE — Two Cedar Girls’ Secondary students stole the limelight at yesterday’s National Inter-School Track and Field Championships at the Choa Chu Kang Stadium with their record-breaking performances. Cedar’s Sec 4 student Lynette Lim then served up the dish of the day in the afternoon by breaking both a championship record and a national open mark. With a hop, skip and a jump, the 16-year-old rewrote the Girls “B” Division triple jump record of 11.56m as well as the national open mark of 11.73m when she flew across the sand pit to clock a distance of 11.79m. Both records were previously set by Mariam Shazana — the former in 2008 and the latter in 2009. Wong Sumae of Nanyang Girls High School was second (11.27m) while Cedar’s Anissa Sharmaine Jefri Schmitt was third (11.13m). Lynette’s achievement is the second national open record set at this year’s championships. 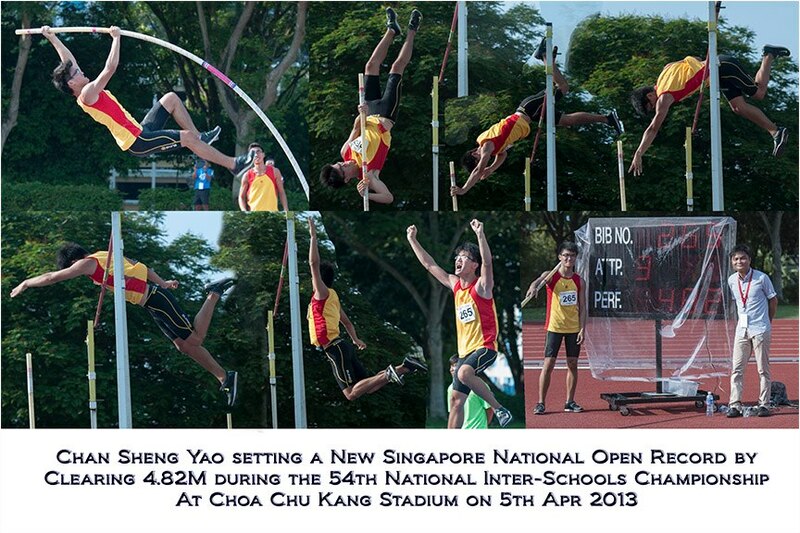 Pole vaulter Chan Sheng Yao broke the national mark during the Boys’ “A” Division competition last Friday. What is even more stunning about Lynette’s feat is that she only started training in the jumps less than three years ago. Back then, she had dreams of being a sprinter, but her coach John Sweem saw her potential in jumps and persuaded her to make the switch in July 2010. In fact, Sweem was hardly surprised when Lynette broke the national mark yesterday. “She is very powerful and springs off from the board very well,” he said. I was planning for her to break the record at this year’s meet as she has consistently shown she could hit 11.50m — what she needed was just the extra push from her competitors. If memory serves me right, this is the first time that two national open records have come a-crashing at the annual schools championship. Last Friday, Sheng Yao also entered his name in the national record books when he broke Sean Lim’s pole-vault record of 4.81m with his 4.82m effort in the Boys A Div competition. According to Lynette’s coach, John Sweem, she has the ability to clear 12m in the next few years. That will be exciting to watch, and let’s hope it happens. Cedar Girls also had another student entering her name in the record books. Low Seow Ting cleared 1.60m in the C Div high jump to rewrite her record of 1.55m which she had set last year. My heartiest congratulations to Lynette and Seow Ting. Fingers crossed that there will be more exciting things to come in the remaining days of competition at the National Schools Championships. Well done, Chan Sheng Yao! It’s been a year since my last post because I’ve been busy with work and other personal commitments. Much has happened in the local sports scene which I’ve not been able to record. Pity. SINGAPORE— Hwa Chong Institution (HCI) student Chan Sheng Yao created local sporting history in the most impressive manner yesterday as he pole-vaulted his way to the Boys “A” Division gold at the 54th National Inter-School Track & Field Championships at the Choa Chu Kang Stadium. The 17-year-old student cleared 4.82m to clinch the title and, in doing so, broke a string of national records in the discipline. Not only did Sheng Yao’s winning height erase Sean Lim’s national open record of 4.81m which was set in June 2011, it is also a new national U-23, national junior and youth mark. That is not all — it is also a new “A” Division record, replacing the 4.80m-mark set by Sean at the 2011 edition of the schools championships. Sheng Yao has also qualified for this December’s South-east Asian Games as a result. Yet, all of this nearly did not happen for the teenager yesterday. After failing to clear 4.31m on his first two attempts, he was under pressure and barely succeeded on his final try to keep his gold medal hopes alive. At that point, the event was still a three-horse race, with Raffles Institution’s Nick Ho and HCI’s Darren Tan still in contention. Once the yoke was lifted from Sheng Yao’s shoulders, he started gunning for the national record. After clearing 4.70m and qualifying for the SEA Games, he then produced his record-breaking feat. He credits Sean, his senior and friend, who is also coached by Yeo, for inspiring him to make such a massive leap from his previous personal best of 4.64m, set at last year’s “B” Division Boys’ final. Sheng Yao now plans to focus on July’s IAAF World Youth Championships in the Ukraine before turning his attention to the SEA Games in Myanmar in December. “My target is to qualify for the final at the World Youth meet and maybe finish among the top three — which usually has a minimum requirement of 5.1m,” he said. Just like how Sean Lim did it in 2011, Sheng Yao broke a whole string of records, including, most importantly, the national open pole vault record, with his 4.82m effort at the ongoing National Schools Track & Field Championships. What a fantastic achievement. My heartiest congratulations to Sheng Yao, and to his coach, David Yeo. Here’s wishing him all the best at the IAAF World Youth Championships in July, and at the SEA Games in Myanmar. Here’s a great picture montage of Sheng Yao’s achievement by Terry Tan Lee Ban. I found it on the Singapore Athletic Association’s Facebook page. Up-and-coming discus thrower Chan Zhi Xuan marked her final year of participation at the National Schools Track and Field Championships in style, and in very much the same manner as she did with the previous editions – by setting a new record in her discipline. The Anglo-Chinese Junior College student hurled 38.86m in the Girls A Division final at the Choa Chu Kang Stadium to win the gold comfortably, and erase the championship record of 38.60m which she set last year. It was also the first record of this year’s championships, and was set on the first day of competition. Zhi Xuan was such a class above her rivals that she finished eight metres ahead of second-placed Nicole Heng of Raffles Institution, who threw 30.80m. Zhi Xuan will bow out of the National Schools Championships with a rare accomplishment of holding all three Divisional championship records – the A, B and C marks. The Singapore Sports Fan would like to congratulate Zhi Xuan on her magnificent achievements and hopes to see her eventually going on to represent the country with distinction at the SEA Games. Fingers crossed. IN the meantime, well done, Zhi Xuan. Two other new records have also been set at this year’s meet. up and take notice with her blistering run of 12.74sec in the C Division Girls 100m heats. The time is 0.01sec faster than current sprint sensation Shanti Pereira’s 12.75sec record which she set in 2010. Can Izlyn go even faster in Monday’s semi-finals and in the final on April 10? We wait with bated breath. The third record was set by pole vaulter Chan Sheng Yao of Hwa Chong Institution today. He cleared a height of 4.64m in the B Division Boys final to shatter the record height of 4.38m which he set last year. My heartiest congratulations to both of them.